NASA to Make Mars 2020 Rover Landing Site Announcement Today! How to Listen Live. 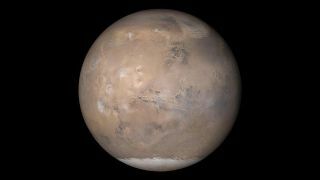 Where to land on Mars? NASA has made its decision for its next mission, which lands in 2021. NASA is prepared to announce which of four final contenders it has selected as the landing site for its Mars 2020 rover, which is due to touch down on the Red Planet in 2021, and we'll all find out more today (Nov. 19). The agency will announce its choice in a news teleconference today at 12 p.m. EST (1700 GMT). Audio and visuals from the announcement will be available to watch here on Space.com, courtesy of NASA TV, or directly at the agency's website. The announcement follows a workshop held in October where hundreds of scientists listened to presentations about the merits and concerns for each of the candidate sites. At the end of that meeting, attendees voted on their preference, and the aggregate results of that vote were sent as a recommendation for NASA to consider in its final decision-making process. It's a weighty decision, since the Mars 2020 rover has a host of intriguing scientific goals to tackle. The mission is designed to search for evidence of possible ancient life on Mars and to gather and store samples that a future NASA mission could one day bring back to terrestrial laboratories. The four landing sites now under consideration for NASA's 2020 Mars rover. Each site has been carefully evaluated for safety risks — landing on Mars is notoriously difficult, and there's no point in risking an expensive spacecraft by choosing a touchdown spot that adds even more danger — and for the geologic interest of nearby rocks. But which site will win? Tune in Monday to find out!